Bradley Air Services Limited, operating as First Air, is an airline headquartered in Kanata, a suburb of Ottawa, Ontario, Canada. It operates services to 34 communities in Nunavut, Nunavik, and the Northwest Territories. The majority of its fleet is available for charters worldwide. First Air has assisted in various humanitarian missions such as the 2010 Haiti earthquake, airlifting relief supplies and equipment. Its main base, which includes a large hangar, cargo and maintenance facility, is located at Ottawa Macdonald–Cartier International Airport, with hubs at Iqaluit Airport, and Yellowknife Airport. The airline was founded by Canadian aviation pioneer Russel (Russ) Bradley and started operations as Bradley Air Services in 1946 and is still registered under that name. First Air started scheduled operations in 1973, between Ottawa and North Bay. This service was operated with an eight-seat passenger plane. The airline opened southern gateways at Edmonton, Winnipeg, Montreal and Ottawa. Through Kuujjuaq in Nunavik and Yellowknife in the Northwest Territories (NWT), the airline provides services to 26 Inuit communities in Nunavut, Nunavik and the NWT. Service to Sanikiluaq, Nunavut is provided in partnership with Air Inuit. In 1995, First Air bought Ptarmigan Airways, and in 1997 it bought Northwest Territorial Airways (also known as NWT Air), both of which were merged into First Air. Ptarmigan Airways operated smaller turboprop aircraft types such as the Beechcraft King Air (BE-200 model), de Havilland Canada DHC-2 Turbine Beaver, DHC-6 Twin Otter and Grumman Gulfstream I propjets in addition to Cessna Citation business jet aircraft. Northwest Territorial operated Boeing 727-100 and Boeing 737-200 jetliners, Lockheed L-188 Electra propjets, Lockheed L-100 Hercules cargo turboprops and Douglas DC-3s. 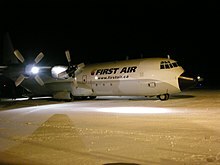 First Air is wholly owned by the Inuit people of Quebec through the Makivik Corporation, which purchased the company in 1990. On August 21, 2008, First Air fired president Bob Davis and replaced him with Scott Bateman. Davis had been president since December 1997 and had several disagreements with First Air over a period of time. On June 5, 2009, First Air received a wide-body aircraft, a Boeing 767-223 SF (Super Freighter), which was under a three-year dry lease from (CAM) Cargo Aircraft Management, a subsidiary of Air Transport Services Group (ATSG). The 767 has since left the fleet. In February 2011, First Air and Qikiqtaaluk Corporation (QC) started a new airline named Qikiqtani First Aviation. The new company provides services throughout Nunavut's Qikiqtani Region using First Air’s fleet. Another airline, Sakku First Aviation, was started the same time in partnership with Sakku Investments Corporation in Nunavut's Kivalliq Region. In December 2011, Scott Bateman, President and CEO, abruptly resigned his position with First Air. Kris Dolinki became President and CEO after Bateman's departure. In October 2012, Dolinki resigned his position as President and CEO of First Air. This announcement came shortly after Makivik Corporation stated that, after many rumours, its stake in First Air was not for sale. The position of President and CEO was filled on an interim basis by Chris Ferris, First Air's Vice President of Marketing & Sales. In March 2013, First Air/Makivik Corporation announced it had hired Brock Friesen as its new President and CEO. On April 11, 2014, the Makivik Corporation and Norterra, owners of Canadian North, announced that they were in negotiations to merge the two airlines. According to a website set up the same day the new airline would be owned equally between the two companies and "a merger would create a stronger, more sustainable business, provide better service to customers and lead to new economic development opportunities across the North. We believe the two companies would complement each other’s strengths." In October 2014, it was announced the merger would not go through, but First Air would still codeshare some flights with Canadian North. In early 2015 First Air announced strategic agreements with Cargojet Airways and Summit Air. The 767 lease was transferred to Cargojet at that time and First Air is now providing ATR Turboprop services to Cargojet. On April 21, 2015, First Air Hercules C-GUSI flew the final civilian L382 flight in Canada, bringing to an end over 45 years of commercial Lockheed Hercules service. L382 Hercules operations in Northern Canada were begun during the 1960s by Pacific Western Airlines. In 2016, First Air/Bradley Air Services is the oldest airline in Canada still operating under its original name. On September 28, 2018, Makivik Corporation and the Inuvialuit Corporate Group (ICG) signed a definitive agreement to merge Canadian North and First Air, awaiting government approval. The new airline would use the new First Air livery, but would operate under the name "Canadian North". According to the Official Airline Guide (OAG), First Air operated scheduled passenger service from the mid-1980s to the early 1990s nonstop between Ottawa (YOW) and Boston (BOS) primarily with Hawker Siddeley HS 748 turboprops but also with Boeing 727-100 Combi jetliners as well. This was the only scheduled passenger service ever operated to the U.S. by First Air. 28 January 1974, a Douglas C-47B CF-TVK, a de Havilland Canada DHC-6 CF-DIJ, and de Havilland Canada DHC-3 CF-OHD of Bradley Air Services were destroyed in a hangar fire at Carp Airport, Ottawa. 23 August 1978, a de Havilland Canada DHC-6 C-FQDG of Bradley Air Services was destroyed in Frobisher Bay (now Iqaluit), NU. 29 August 1979, a de Havilland Canada DHC-6 C-GROW of Bradley Air Services was destroyed in Frobisher Bay (now Iqaluit), NU. 15 March 1981, a de Havilland Canada DHC-6 C-FDHT of Bradley Air Services sunk through polar ice near Nord, Greenland. 15 September 1988, a Hawker Siddeley HS 748 C-GFFA of Bradley Air Services was destroyed in a crash near Hammond, ON. 12 January 1989, a Hawker Siddeley HS 748 C-GDOV of Bradley Air Services was destroyed in a crash near Dayton, Ohio. 12 August 1996, a de Havilland Canada DHC-6 C-GNDN of First Air was destroyed near Markham Bay, NU. 3 December 1998, a Hawker Siddeley HS 748 C-FBNW of Bradley Air Services was damaged beyond repair while attempting take-off at Frobisher Bay (now Iqaluit), NU. 22 May 2001, a Boeing 737-210C C-GNWI of First Air was damaged beyond repair after landing in Yellowknife, NT. 25 February 2004, a First Air Boeing 737-200 (C-GNWN) returning to Edmonton as a ferry flight from Lupin Mine landed beside the runway and traveled approximately 1,600 ft (490 m) before returning to the runway. There were no injuries. 20 August 2011, Flight 6560, a First Air Boeing 737-210C (C-GNWN) flying a charter flight crashed en route from Yellowknife on final approach to Resolute, killing 12 and injuring 3 others. ^ "Transport Canada – Air Traffic Designators – TP 143" (PDF). Retrieved 2 January 2018. ^ a b "Canadian Civil Aircraft Register: Quick Search Result for Bradley Air Services (First Air)". Transport Canada. Retrieved 7 June 2018. ^ a b "First Air fleet details". Retrieved 7 June 2018. ^ a b c d e "Route Map — First Air — 1 800 267 1247". firstair.ca. Retrieved 2 January 2018. ^ a b "First Air Head Office." First Air. Retrieved on 13 January 2012. 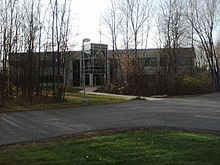 "20 Cope Drive Kanata, Ontario Canada, K2M 2V8"
^ a b "Officers". Firstair.ca. Retrieved 10 January 2013. ^ "Northern airline sends planes to Haiti". Cbc.ca. 14 January 2010. Retrieved 10 January 2013. ^ "Directory: World Airlines". Flight International. 3 April 2007. p. 82. ^ "Milestones". Firstair.ca. Retrieved 10 January 2013. ^ "First Air". Makivik.org. Retrieved 10 January 2013. ^ "Ownership". Firstair.ca. Retrieved 10 January 2013. ^ "First Air fires president Davis". Cbc.ca. 22 August 2008. Retrieved 10 January 2013. ^ "Transport Services Group to Lease 767 to First Air". Abxair.com. 6 March 2009. Retrieved 10 January 2013. ^ "Qikiqtani First Aviation Ltd". Qfal.ca. Retrieved 10 January 2013. ^ "Qikiqtaaluk Corporation and First Air sign new airline joint venture agreement". Firstair.ca. 17 February 2011. Retrieved 10 January 2013. ^ "Sakku First Aviation Ltd". Sfal.ca. Retrieved 10 January 2013. ^ "First Air's president resigns Dec. 14". Nunatsiaqonline.ca. 14 December 2011. Retrieved 10 January 2013. ^ Oct 4, 2012 8:25 AM CT (4 October 2012). "First Air not for sale, says Makivik Corp. – North – CBC News". Cbc.ca. Retrieved 10 January 2013. ^ "First Air gets a new boss. – North – Nunatsiaq News". Nunatsiaq News. 25 March 2013. Retrieved 25 March 2013. ^ "Canadian North, First Air plan 'merger of equals'". Retrieved 2 January 2018. ^ "NunatsiaqOnline 2014-04-11: NEWS: Arctic airlines First Air and Canadian North talk merger". www.nunatsiaqonline.ca. Retrieved 2 January 2018. ^ "Nectar Sleep Mattress & Test Clear - Sleeping & Testing Coupons". newnorthernairline.com. Retrieved 2 January 2018. ^ "NunatsiaqOnline 2014-10-23: NEWS: Airlines announce First Air-Canadian North merger is dead". www.nunatsiaqonline.ca. Retrieved 2 January 2018. ^ Group, Inuvialuit Corporate. "New milestone agreement reached to merge First Air and Canadian North to better serve Pan-Arctic communities". www.newswire.ca. ^ JL (4 May 2012). "First Air and Air Greenland Begin Codeshare". Airlineroute.net. Retrieved 10 January 2013. ^ "NunatsiaqOnline 2016-05-11: NEWS: First Air, Air North strike codeshare deal for Ottawa, Yellowknife, Whitehorse". www.nunatsiaqonline.ca. Retrieved 2 January 2018. ^ "Codeshare Agreement". Retrieved 2 January 2018. ^ "NunatsiaqOnline 2015-07-28: NEWS: Canadian North, First Air carry out codeshare pact in Nunavut this week". www.nunatsiaqonline.ca. Retrieved 2 January 2018. ^ "NunatsiaqOnline 2016-11-18: NEWS: Codeshare kaput: First Air ends flight sharing deal with Canadian North". www.nunatsiaqonline.ca. Retrieved 2 January 2018. ^ Accident description for CF-OHD at the Aviation Safety Network. Retrieved on 2016-02-15. ^ Accident description for CF-TVK at the Aviation Safety Network. Retrieved on 2016-02-15. ^ "Otter of the Week". Fly the Bush. Retrieved 21 March 2011. ^ Accident description for C-FQDG at the Aviation Safety Network. Retrieved on 2016-02-15. ^ Accident description for C-GROW at the Aviation Safety Network. Retrieved on 2016-02-15. ^ Accident description for C-FDHT at the Aviation Safety Network. Retrieved on 2016-02-15. ^ Accident description for C-GFFA at the Aviation Safety Network. Retrieved on 2016-02-15. ^ Accident description for C-GDOV at the Aviation Safety Network. Retrieved on 2016-02-15. ^ Accident description for C-GNDN at the Aviation Safety Network. Retrieved on 2016-02-15. ^ Accident description for C-FBNW at the Aviation Safety Network. Retrieved on 2016-02-15. ^ Accident description for C-GNWI at the Aviation Safety Network. Retrieved on 2016-02-15. ^ Canada, Government of Canada, Transportation Safety Board of. "Aviation Investigation Report A04W0032". www.tsb.gc.ca. Retrieved 2 January 2018. ^ "First Air 737 Crashes in Northern Canada, Killing 12 - NYCAviation". 20 August 2011. Retrieved 2 January 2018. ^ "Plane crash near Resolute Bay kills 12". Retrieved 2 January 2018. Wikimedia Commons has media related to First Air.